This article includes the details of how to use the Content Items Due widget on your DivvyHQ Dashboard. The Content Items Due widget displays a 30-day, chronological list of content items that are currently in production and associated with the calendars to which you have access. In addition, your role within certain calendars will affect which content items are displayed. 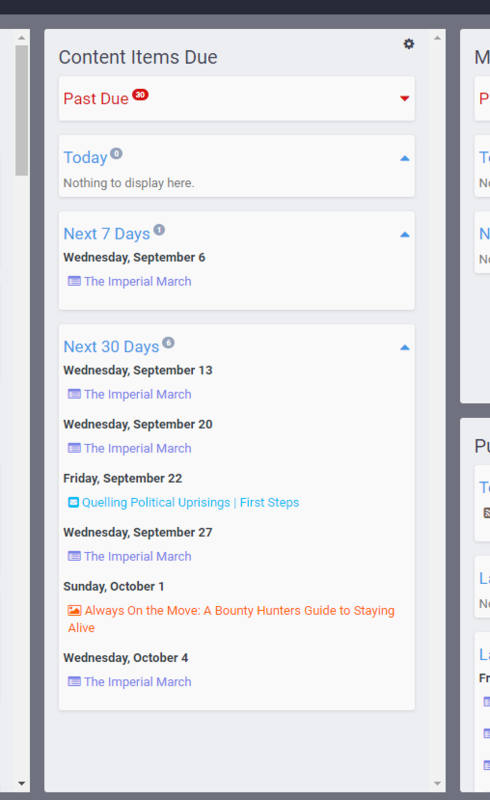 For example, account admins and editors will see all content associated with each calendar, but contributors and reviewers will only see content items to which they are assigned in this column. Single clicking a content item title in this widget will open the content item slide-in, which provides a quick snapshot of the key details and production steps/tasks associated with that particular content item - plus the ability to edit them! If you wish to edit a content item, without opening the content item slide-in, double click the content item title to proceed to the Divvy content editor. Set your dates or click the checkboxes next to your desired calendars or team members, then click the blue Update Feed button at the bottom. Your Content Items Due widget will now be populated with content items that match your filter settings. DivvyHQ will remember your settings until you change them. To remove or edit your filter settings, click the gear icon and then click the Reset Filters link in the lower left.